To make the crust, place the graham cracker crumbs, butter and Nutella into the bowl of a food processor. Pulse until the mixture starts to clump together. Add the hazelnuts and continue to pulse until the texture is damp and sandy. Tip the crumb mixture into a 9" spring form pan. Cover with parchment paper or spray your hands with a light coating of cooking spray and press the mixture evenly into the base. To make the filling, place the chocolate in a blender. Bring the water, Frangelico and sugar in a saucepan to a simmer. Cover tightly; blend 5 seconds. Cover tightly; blend on high for 1 minute. Place on serving plate and remove from the pan. 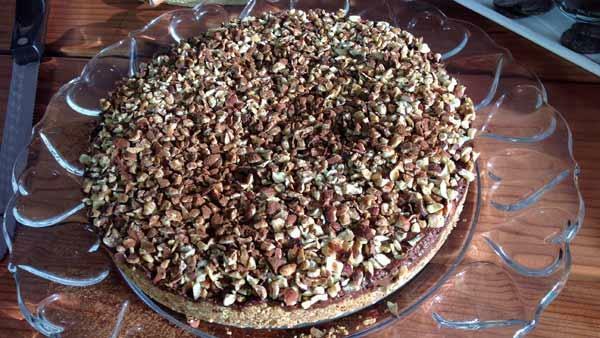 Cover the entire cake with the toasted hazelnuts and dust with cocoa powder. Keep refrigerated until ready to serve. It is also good frozen!